If you’re an iOS 10 user, you should install Zestia (Cydia alternative) to get the amazing features much like jailbreak. You are familiar with pros and con of jailbreaking your iPhone. IOS 10 jailbreak is plagued with errors and is not as seamless as it used to be for earlier iOS versions. Therefore, users are increasingly looking for Cydia alternatives to get the jailbreak like freedom with their iOS devices. You cannot deny the freedom and usefulness of Jailbreaking because it allowed you to customize your entire interface as well as remove features which you found less attractive from your iPhone. In the current scenario many inexperienced users feel reluctant to jailbreak for obvious reasons. Therefore, there is an increase in apps that are Cydia alternatives such as Zestia. If you install Zestia, it serves as a Cydia alternative, to provide you access to apps that are not available in the Apple App Store. 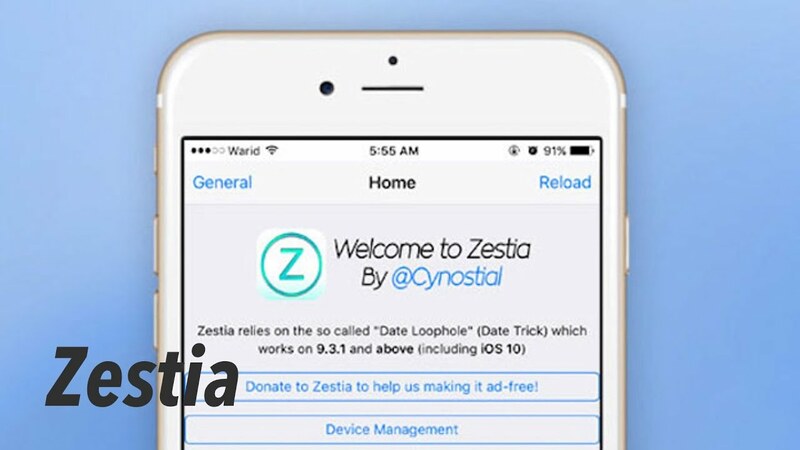 You don’t need to jailbreak your device to install Zestia on your iOS device. There are many other Cydia alternatives such as Mojo Installer, iNoCydia and Extensify that employ the technique of sideloading apps through Cydia Impactor or using app installers. These Cydia alternatives allow you to install several popular jailbreak tweaks on your iPhone and iPad. Recently, in June 2016, a Cydia-like app Zestia was launched that is similar to aforementioned apps. People are more inclined to install Zestia app as it popular apps like Snapchat++, Instagram++, Spotify++, etc. that people love to use. If you want to install Zestia (Cydia Alternative) for iOS 10 (iPhone/iPad) then you have to follow the very simple steps mentioned below. No jailbreak required. Step 1: Open your Safari browser from stock iPhone/iPad apps. This is because the webpage for installing Zestia is only compatible with Safari Browser. Step 2: Type the URL http://zestia.lmdinteractive.com/ in it. Step 2: The button will appear, “Tap here to Install Zestia directly…” Click on this button to start the installation process of Zestia. Step 4: Tap the Install button and install the profile for which you will need a pass code as well. Tap Install > (Enter your passcode if required) > Trust profile. Step 5: Within few minutes, the installation will start and you can see the Zestia icon visible on your home screen. Step 6: Go to “All applications” options from the bottom menu to install all the possible tweaks and side load apps you want to enjoy. After you are done installing Zestia (Cydia alternative) you can find almost every possible jailbreak tweak and app in it. You do not need to bother about the reinstallation of the apps because you have already downloaded them in your iOS device. However, after you install Zestia, you will find it an excellent Cydia alternative. You will be able to download bundles of sideloaded apps, popular apps and tweaks which you can otherwise only download with jailbreak on your iPhone 10. Earlier in 2016, when Zestia was newly launched, you need to complete UDID registration after passing through the entire installation process. It took three or more days for the confirmation of your registration process. But the process is more simplified now. It has also removed excessive advertisements in the application that is quite a welcome change. 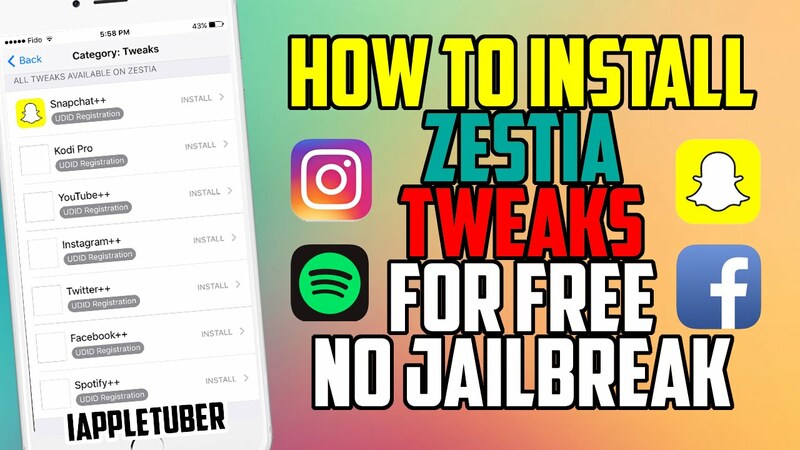 Do install Zestia and you will surely feel that this is one of the best Cydia alternative app for enjoying apps and tweaks without jailbreaking iOS device.